George Eliot’s 1874 novel Middlemarch is said to both thematize and foster intersubjectivity through its psychologically rich and detailed portrait of human life. To elide the distinction between the human psychology and what I will refer to as its material substrate—character—however, risks overlooking the extent to which Eliot approaches subjectivity as an impersonal structure formed not just through intentional acts such as thought or speech but through physical actions and reactions as well. Deidre Lynch has shown how the protocols of interiority attributed to the novelistic modes of characterization were not endemic to the novel genre, but emerged, rather, in attempts to “validate and naturalize a concept of character as representational.” Extending and elaborating upon Lynch’s thesis, I show how, in conversation with nineteenth-century materialist science, Eliot pushed back against the interiorized novelistic subject so often attributed to her by producing not only sympathetic and real-seeming minds but also lively and responsive characterological bodies…. Brilmyer’s essay tracks George Eliot’s construction of a layer of descriptions of characters as soft matter—as liquids, polymers, and other types of condensed matter in a malleable state—in her 1874 novel Middlemarch, elucidating what she calls a physics of character from within its pages. In so doing, the essay suggests that even the most notoriously “brainy” of novels—on the level of its descriptions—resists a too-easy alignment of its characters with individual human psychologies. 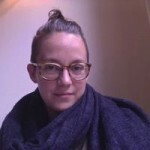 S. PEARL BRILMYER is Assistant Professor of English at the University of Oregon and postdoctoral fellow at the Institute for Cultural Inquiry in Berlin, Germany. She is currently at work on two projects, The Prism I Hold in My Hand, an experimental, excerpted edition of a 1926 novel by the South African writer Olive Schreiner, and a book project about problems of description and characterization in late Victorian fiction and philosophy. A companion article on Eliot and characterization has recently appeared in PMLA 129, no. 1.